Is Something Bugging You? | Faddegon's Nursery, Inc.
Jun 8, 2018 | Blog, What's New? Insects are an integral part of a healthy garden and yard – without them, our plants would suffer enormously, but there are a few that we need to control for our health and safety. Here in the Northeast, ticks are of particular concern because of Lyme disease carried by the deer tick. Mosquitoes and fleas can also transmit diseases and are just plain annoying as well. This can impact our enjoyment of the outdoors. There are some things you can do to augment your use of repellents, and in some cases, you may be able to attack the problem naturally without using harmful chemicals at all if that’s your goal. 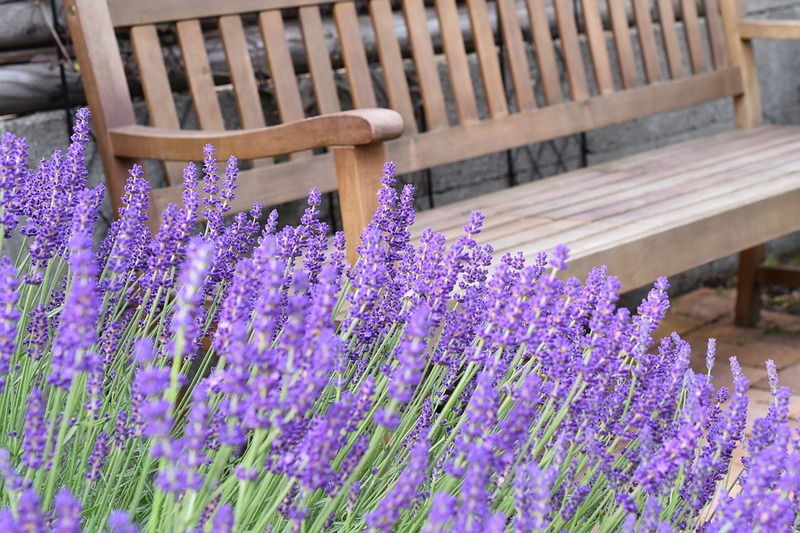 A member of the mint family, Lavender has everything you might want in a garden perennial. Beautiful and fragrant, lavender repels fleas, ticks, mosquitoes, and moths. Plant some near your patio or deck, and it goes a long way to keep the area free of unwanted insects. For even better protection snap off some of the flowers and foliage, rub on your skin, and enjoy a natural insect repellent! Farmers and vegetable growers have long known that marigolds have properties that repel a host of destructive insects in the soil. The roots themselves have a compound that repels whiteflies, cabbage maggots, aphids, and others but the did you know they also repel fleas, ticks, and mosquitoes? In the ground or potted up, there are many reasons to love marigolds. This vast family of plants is like magic. It smells lovely, tastes fantastic, and you don’t need a green thumb to grow it. In fact, it can be aggressive so if you’re opposed to that aspect, keep it in pots. Mint is so disliked by so many garden pests that there is just no reason not to grow some. Mint comes in lots of flavors, but they all share the ability to repel ticks, mosquitoes, fleas, ants, moths, chiggers, and mice! Catnip is the ultimate mosquito repellent having ten times the strength of DEET according to the American Chemical Society and Iowa State University. Why? It contains nepetalactone. The same essential oil is present in Walker’s Low Catmint (Nepeta) at slightly lower levels, but it will also attract one or two fewer cats! Along with mosquitoes, rabbits and deer also have an intense dislike for catmint making it an excellent addition to the perennial garden. If you enjoy the neighborhood cats go ahead and plant some catnip instead! Yes, you guessed it. Another member of the mint family, Rosemary may be irresistible to cooks and aromatherapy lovers, but mosquitoes wouldn’t agree. Here’s a practically effortless way to use it along with planting it. Boil the leaves in a 1 to 1 ratio, leaves to water. Strain the liquid into the same amount of cold water and store in the refrigerator. Putting this in a small spray bottle for using on yourself or your area works wonders. That fabulous lemony smell in the breeze is, of course, lemongrass. It’s a close relative of citronella, containing some of the same oils. Growing to up to 4 ft in a season, you’ll have plenty to use for cooking and repelling fleas, ticks, and mosquitoes. Leaves can be removed, cut or torn into small pieces, and sprinkled around any area for a good shot of insect repelling magic and a fantastic scent. Citronella is a member of the geranium family. Along with scented geraniums, citronella is well-known for its ability to repel mosquitoes but only when a leaf is crushed, and the oils rubbed on the skin. Left alone, the Mosquito Plant does little to ward off insects, but it makes an excellent plant to keep in a seating area for use when the late afternoon pests show up. You either hate them or love them, but there’s no denying that garlic and plants in the allium family may send fleas, ticks and aphids in another direction. Planting alliums with roses and any plant that aphids love will help you battle these garden pests. The allium family includes large ornamentals as well as chives, garlic, chives, leeks, and shallots. Common or Garden Sage (Salvia officinalis) is known to be particularly offensive to ticks. As with most of the plants on this list, sage serves many purposes. Used in the kitchen, as an ornamental in the garden, or for herbal remedies, growing it will give you peace of mind knowing you’re also repelling ticks around the yard. Not all plants are Pet-friendly so if you have a particularly chomp-happy cat or dog we suggest the A.S.P.C.A. list of plants toxic to cats and dogs. Click here to check their website. p.s. If you have a local possum lurking around your property, consider yourself lucky! One possum will consume about 5,000 ticks in one season!